We are excited to announce the Dedication Ceremony of the Skylar Learning Center at the Santa Barbara Bird Sanctuary will take place Wednesday, June 19, 2013 from 4:30pm – 7:30pm. Phase One of the project will be revealed and Skylar will be joining us for the dedication. After a word from our sanctuary director, Jamie McLeod, and Skylar hors d’oeuvres and refreshments will be served. While it is heartbreaking to lose a feathered friend there is always the very real possibility that our companion animals, especially birds, will outlive us! The Santa Barbara Bird Sanctuary was fortunate to have Christopher C. Jones, a respected local estate planning lawyer, attend one of our board meeting in 2012 to educate us on the importance of planning for the possibility that our pet’s lifespan will exceed our own. We learned about two very exciting options to make sure the pets we love so much are cared for after our passing. Most people have a will or trust in place to deal with their property. What I was surprised to learn from Mr. Jones was that pets are considered “property.” Every year about 500,000 pets go to various organizations due to the death or disability of their owner and ultimately half of those pets are put to death. Pet owners need a pet trust to protect their companions. A personal trust costs an average of $2500 but Mr. Jones and his partners have created a cost effective, revisable solution for companion animals that can be created online, and covers all of the pets in a household, for only $89. You can find out more about these pet trusts at www.trustedpetpartners.com. I knew right away I needed a trust for my Sun Conure, Scarlet. He is a sweetheart to me, but loud and vicious to everyone else, and as such, would not be quickly placed in a new home in the event of my passing. I created a trust so I know there will be money to provide care for my friend while the best possible second home is found for him if he outlives me. I partially funded my trust and can add more funding later which is a great feature. The second way to help the feathered friends we all love so much is to include the Santa Barbara Bird Sanctuary in your planned giving. It’s as easy as adding a line to your will or trust saying ‘I hereby bequeath (describe dollar amount, or property) to the Santa Barbara Bird Sanctuary, a nonprofit corporation, located at 2430 Lillie Avenue, Summerland CA 93067, for its general fund.’ At any given time there are over 60 birds being cared for in the sanctuary and funding and donations are always needed. With your help the sanctuary will be able to continue to grow and fulfill its mission. 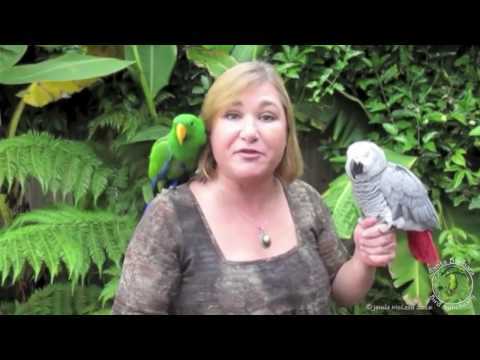 To learn more about creating a pet trust online visit www.trustedpetpartners.com and to learn more about how you can include the Santa Barbara Bird Sanctuary in your will or trust please stop by, or call or email us, for more information. Get up early in the morning & have a cup of coffee. It’s going to be a long day, so place your Parrot on a perch nearby to keep you company while you prepare the meal. Brew another pot of coffee. While it is brewing, clean up the torn filter. Pry coffee bean from Parrot’s beak. Have another cup of coffee & remove Parrot from kitchen counter and return him to perch. Set a stick of butter out on the counter to soften — think better and return it to the refrigerator. Wipe down counter to remove mashed potato claw tracks. Remove Parrot from kitchen counter and return him to perch. Cut the pie into serving slices. Wipe whipped cream off Parrot’s beak and place large dollops of remaining whipped cream on pie slices. Sit down to a nice relaxing dinner with your family — accompanied by plaintive cries of “WANT DINNER!” from the other room. A few days before Halloween we got a call from Rabobank in Carpinteria who had a huge pumpkin to donate to our feathered goblins. Parrots relish cooked squash and pumpkin so we thought that would help feed the flock for awhile. After picking up the monstrous pumpkin that weighed 135 pounds we decided to take the opportunity to carve it up…..hope your Halloween and Thanksgiving was as much fun as ours! Hilary Swank names SBBS as one of her favorite charities! Check this out from People Magazine! Hilary named us as one of her favorite charities. Santa Barbara Bird Sanctuary loves Hilary and her silly grey “Seuss”!